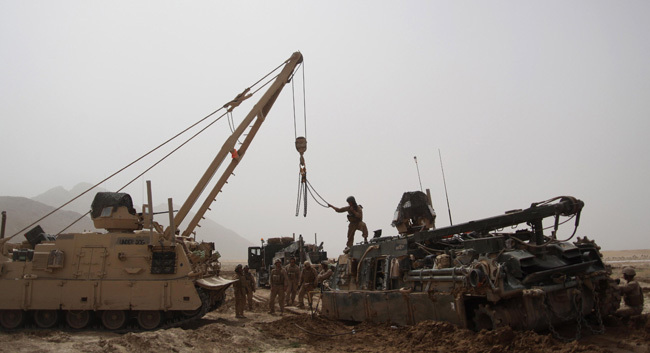 BAE Systems received a $28.7 million contract to upgrade 11 M88A1 Medium Recovery vehicles to the M88A2 Heavy Equipment Recovery Combat Utility Lift Evacuation System (HERCULES) configuration. 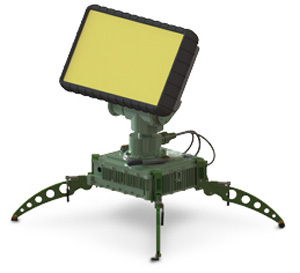 HERCULES is the improved recovery system of choice for today’s 70-ton combat vehicles. To date, 575 HERCULES vehicles have been fielded against an overall U.S. Army requirement of 632 vehicles, and a total of 84 vehicles have been fielded to the U.S. Marine Corps. The award brings the total value of U.S. Government contracts that BAE Systems has been awarded on the HERCULES program to $2.1 billion. “This contract demonstrates the continued need to invest in the HERCULES and shows the Army’s commitment to the irreplaceable role it serves.” said Mark Signorelli, vice president and general manager or Armored Combat Systems at BAE Systems. The upgrade work will be performed by the existing workforce at BAE Systems operations in York, Pennsylvania and Aiken, South Carolina. The contract was awarded by the U.S. Army TACOM Life Cycle Management Command with deliveries to conclude in March 2014. The M88 plays a critical role the company’s campaign to maintain the Bradley Industrial Base by protecting the affordability of the Army’s combat vehicles. 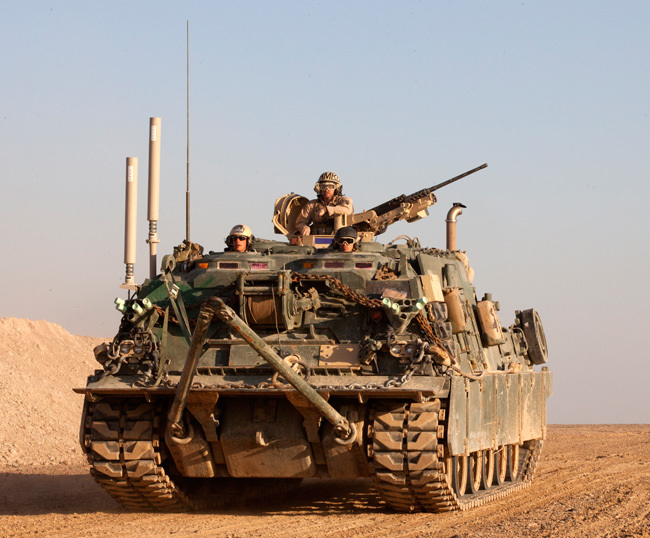 BAE Systems’ York facility is responsible for four of the five U.S. Army Armored Brigade Combat Team (ABCT) vehicles, including the Bradley and the M88. In addition to proposing that Congress provide base level investment in critical combat vehicle improvements, BAE Systems is working with the Army to secure increased funding for the M88 program to help carry the workload at the facility. The M88A2 HERCULES offers operational and logistics commonality with the existing M88A1 fleet, which provides simplified training and parts availability benefits to the end-user. Key upgrades for the HERCULES include: improved power-assisted braking, steering, winching, hoisting, and increased horsepower. HERCULES has the lowest acquisition, operational and maintenance cost of any 70-ton capable recovery system, answering the need for cost-effective, self-supporting heavy recovery performance. The M88A2 provides unparalleled capability for recovering today’s 70-ton combat vehicles including the M1A1, M1A2, Leopard MBT, bridging systems, and other medium weight vehicles. A new Pentagon assessment of Iran’s military power maintains that in two years time, Iran could flight-test an intercontinental ballistic missile capable of striking the United States, given “sufficient foreign assistance”, is provided to Tehran. The new assessment reiterated a longstanding estimate of the U.S. intelligence community. Iran could test such a missile by 2015 with assistance from nations like North Korea, China or Russia. Pyongyang is already in the process of developing the KN-08, an extended range ballistic missile that can reach the US West Coast. The missile’s range could be extended to provide the missile an intercontinental strike capability. Pyongyang and Tehran have been collaborating and exchanging technologies regarding ballistic missiles and nuclear weapons for many years; both countries are seeking to match the two technologies to acquire nuclear weapons delivery capabilities. U.S. experts agree that North Korea and Iran could be capable of developing and testing few ICBM class missiles based on liquid propellants, but doubt they could acquire solid-propelled weapons in the near future. The lengthy pre-flight procedures required for fuelling liquid-propelled missiles means that such weapons cannot be mass-fired without warning, as the shorter range missiles could, therefore, providing the defender time to respond, employ missile defense or conduct preemptive attack. An unclassified portion of the “Annual Report on Military Power of Iran,” dated January 2013 and made available by the Pentagon today, also states that Iran is continuing to develop both the “technological capabilities applicable to nuclear weapons” and “ballistic missiles that could be adapted to deliver nuclear weapons.” In December 2012 US sources were sceptical about Iran’s ability to reach such milestone by 2015. Tehran encountered a major obstacle in 2011, after an explosion killed 21 people during a test, among the casualties was Hasan Tehrani Moghaddam, who was in charge of the country’s missile program. Iran “also continues to develop ballistic missiles that could be adapted to deliver nuclear weapons,” it states. Despite “increased pressure resulting from sanctions” imposed by the United Nations, there “has been no change to Iran’s national security and military strategies over the last year,” according to the report. In the past Iran was reportedly working on ‘Project Koussar’, a ballistic missile capable of reaching targets at ranges of 4000 – 5000 km. These missiles, sometime referred to as Shahab 5 and Shahab 6 were believed to be based on different propulsion used on the Shahab 3. Some sources indicated the Iranians were erlying on the RD-216 originally developed for the SS-5 IRBM and also used to with the Kosmos SL8 satellite launcher. James Clapper, the director of national intelligence, told the Senate Select Committee on Intelligence last month that “we do not know if Iran will eventually decide to build nuclear weapons.” The U.S. government’s 17 intelligence agencies, according to Clapper, “judge Iran would likely choose a ballistic missile as its preferred method of delivering a nuclear weapon, if one is ever fielded,” he said in the U.S. intelligence community’s annual worldwide threat assessment. These missiles are capable of delivering a weapon of mass destruction, he said. “In addition, Iran has demonstrated an ability to launch small satellites, and we grow increasingly concerned that these technical steps — along with a regime hostile toward the United States and our allies — provide Tehran with the means and motivation to develop larger space-launch vehicles and longer-range missiles, including an intercontinental ballistic missile,” according to Clapper. The Danish Army has received five Armadillo type armored infantry fighting vehicles for testing. The vehicle is based on the CV90 chassis was configured by BAE Systems Sweden for protected infantry transport. Earlier in April BAE shipped the five vehicles to the Danish army Oksbol base for competitive evaluation. The tests, which begin in April and continue through September, will evaluate the new vehicle’s ability to meet Denmark’s armored personnel carrier requirement. BAE Systems is also offering the vehicle to other countries, among them Canada. Armadillo is a turretless version of CV90 with ballistic and mine protection which exceed Stanag 4a/b. Removal of the turret gives six tonnes of “spare” payload for further protection or other purposes on top of its “fighting configuration” while its state-of-the-art electronic architecture allows “plug and play” of new systems. 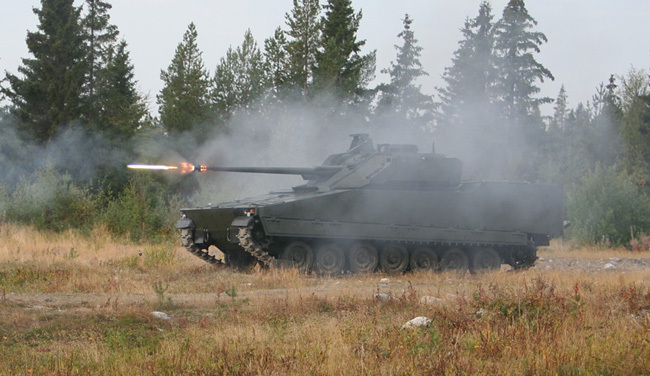 The CV90 was originally designed by Hagglunds and was fitted with a Bofors gun turret. It came into service in 1993. The light tank variant of the vehicle, designated CV9035 MkIII infantry fighting vehicle is operational with the Danish Army since 2007. Denmark plans to replace its existing fleet of M113s and BAE Sweden is one of four contender for the program. Other options considered are the Piranha V from GDLS Europe and G5, yet another upgrade of the M-113, proposed by FFG, which will bring this old design to a new APC status. Denmark is expected to select its future APC variant in 10 months, around February 2014. First deliveries will commence in 2015. According to BAE Systems, Armadillo offers class-leading protection and optimum mission flexibility. 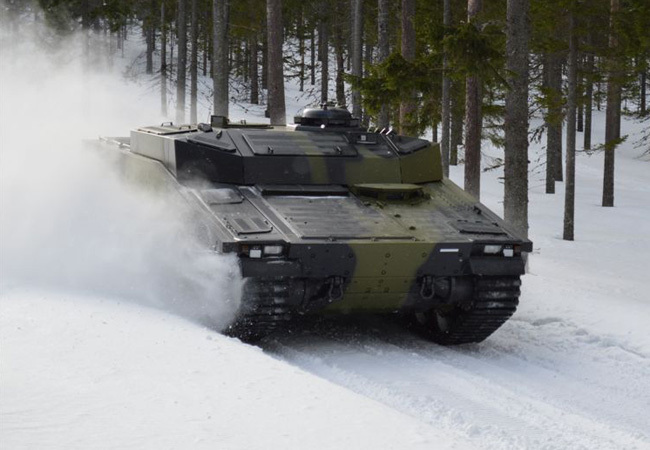 Unlike the G5 or Piranha V, it will be produced on a ‘hot’ production line, with CV90 tanks built for Norway, therefore offer the benefit of production scale and shared costs. Moreover, CV90 platforms are currently operational with six existing operators, adding to the platform’s attractiveness as a low-risk solution, both for initial purchase and long-term sustainment and upgrade. The Danish contract requires the supplier to bind to support the fleet over a period of 15 years. The French President Francois Hollande will release a long-awaited update to the nation’s defense strategy Monday. Aviation Week reports. On a post in the Ares blog, Amy Svitak comments the document will outline France’s response to changes in the defense and security environment since 2008, when the most recent iteration of the strategy was issued under former French President Nicolas Sarkozy. According to French Defense Minister Jean-Yves Le Drian three things have changed since the last white paper was issued in 2008: The evolution of American defense posture with a new orientation to the Asia-Pacific region; a need for European and other nations to clean up their finances; and a more focused push to create a common European defense policy. “We must use all of our energy finishing development within the time and money we have, we must continue to drive the cost of producing F-35s down, and we must start today to attack the long term life cycle costs of the F-35 weapon system.” Air Force Lt. Gen. Christopher C. Bogdan have set these three goals in his testimony to the Senate Armed Services Committee’s airland subcommittee Wednesday, April 24, 2013. Bogdan, the Program Executive Officer for the F-35 Joint Strike Fighter (JSF) told the committee the program has made progress, but obstacles still remain, in software integration, affordability and future operating and support costs. Sequestration further complicates the acquisition as well, he added. Sequestration has the potential either to stretch the development program out or reduce the capabilities warfighters can get, Bogdan said. 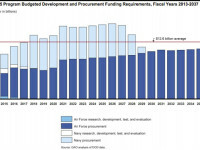 By cutting funds from the program Sequestration is likely to stretch out, causing the more cost overruns for the troubled program that has just recently recovered from major delays and cost increases. “This will have impacts on international partners,” Bogdan warned. “The increases may result in reduction of their aircraft quantities, which would, in turn, increase unit costs even more and cause them to relook their commitment to the program” Bogdan said. Members can read the full version of this article – subscribe now! 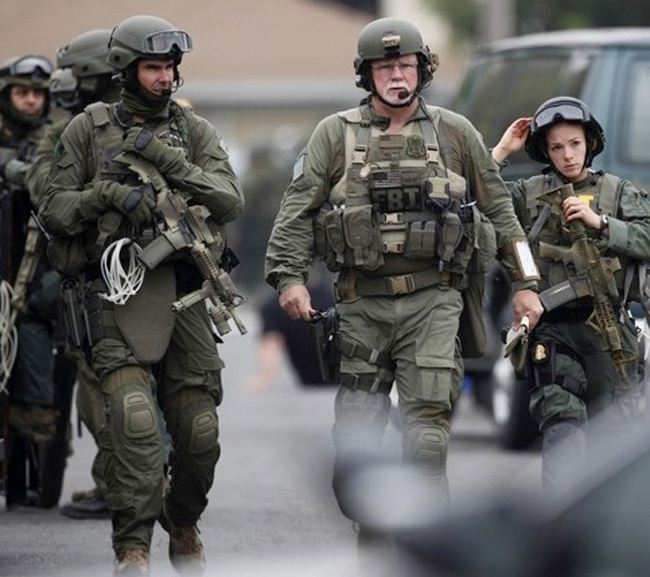 FBI Tactical team deployed to Boston, 2012. 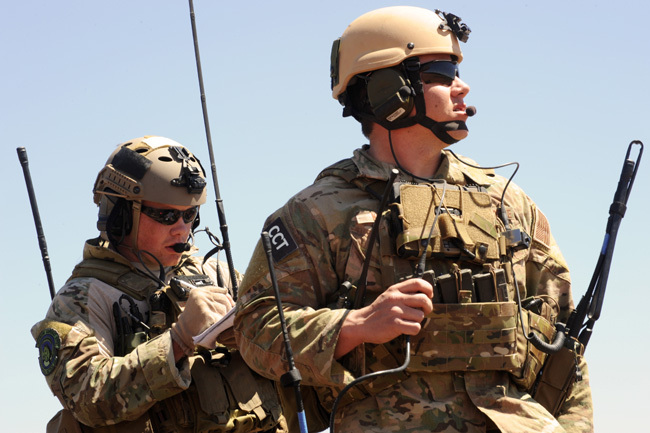 Team members’ kits include the C4OPS, to offer clear communications and hearing protection on assault operations. Warfighters pay a high price for lack of auditory protection, but often they consider such price justified, for it keeps them sharp to react quickly and effectively, thus staying alive in combat. Beside the long-term effect suffered by the individual, implications of auditory damage effect on the team’s performance are also evident. Stunning effect of noise peaks in excess of 130db, often caused by explosions (friendly or hostile), severely degrade the team’s performance and expose the individuals to unnecessary risks. 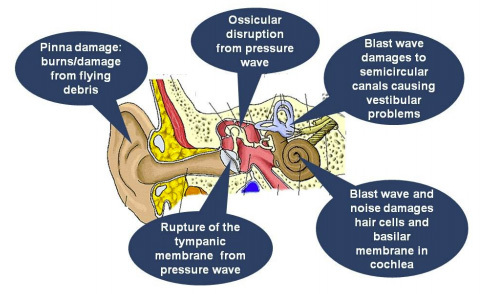 Auditory injuries are often caused by exposure to gunshots or explosions, particularly those experienced in close quarters and built-up areas or by IED blasts. When team members firing nearby, tank gun blasts, or explosive charges going off, warfighters experience excessive noises in combat, in situations they do not expect and therefore, cannot prepare for. Immediately after an explosion, particularly those coming as a surprise, soldiers experience few seconds of shock, or incapacitation, their ears buzzing. Through this time they are vulnerable and exposed. According to the US Department of Veteran Affairs, hearing loss is one of the most common type of disability reported by veterans and the second largest segment in compensation payments. The US Government spends over $1.1 billion annually on compensation to veterans with hearing losses caused mostly during service in combat.